What mood do you want at your wedding? A relaxed affair with soft acoustic or blues music playing in the background? Or do you want it to be a big, happy celebration with a live rock or pop band that gets everyone in the mood to dance? Or maybe you want a bit of both. Many couples will opt to have live music, whether a string quartet or acoustic duet for the ceremony and then a DJ or playlist for the reception when they want their favourite pop songs played – and to save a bit of money. 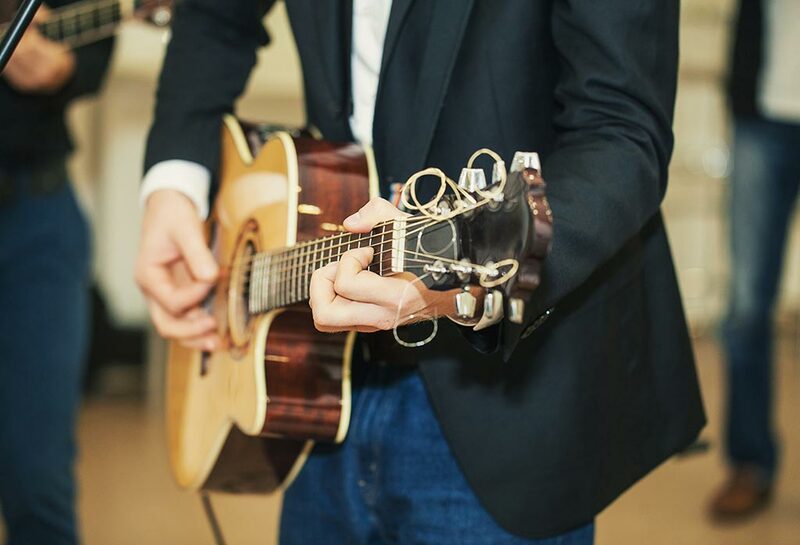 Alternatively, you could choose to have particular songs played with a recording at your ceremony and then have a full live band at the reception. Will you have a main instrument for your ceremony music? Talk to one another about what makes a song meaningful to you – is it the lyrics, or association with a memory that makes a song important to you? If you’re feeling totally trumped for where to start, this helpful article on Beaucoup gives some good examples of songs for traditional, most popular and modern song choices.